Today was all about strudels: Golden brown, flaky, and filled with yummy contents like salmon and herbs. I don't need to mention that I was stuffed to the gills again. 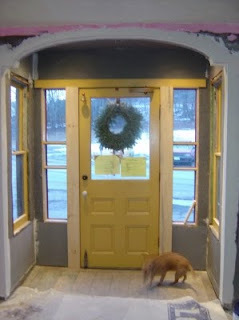 I finished installing the drywall in the main entrance, and got half of the window and door trim up. "I like the door room. We wanted to let you know we both tried the Strudel now and we give it 2 super enthusiastic thumbs way up. Absolutely delicious! I say perfect blend of sweet and savory and James' feedback is "you should serve it by the dozen" Happy to keep tasting for you. Very happy. Dirk - thanks for the link. Will check it out tomorrow had to go to the big bad city for a day, now I'm back (followed by a sigh of relief). as we drove by to pick up the kids, we saw you working in the doorway. That beep you heard, that was us. Well, I'll be you hear a lot of beeps during the course of the day.